Conservation is an incredibly complicated and wide-ranging endeavour. There are many aspects to account for when protecting and conserving the fauna and flora of a given area. Adaptability is key as unpredictable elements and uncontrollable factors can swoop in to change your well-thought-out plans. Thus the scope of conservation requires a HUGE amount of research that must be gathered and continued on an on-going basis. Knowledge is definitely power! Thankfully, some recent advances in technology can assist ecologists, conservationists and rangers in gathering intelligence and data in quantities that previously were not possible without months of slogging leg work and a fair bit of luck. I’d like to highlight one of my favourite tools to be developed in the age of modern technology that we’ve been utilising recently at Leopard Mountain Safari Lodge – The Trails Camera. Trails Cameras are an increasingly popular means of studying the presence – or absence – of species within a given target area. The advances in flash technology, infrared sensors, SD memory cards and rechargeable batteries mean that Trails Cameras can be used for extended durations of surveying, in a continuous research manner, with relatively low personnel demands. As an example, we set up a camera recently on a game path the rangers had been eyeing out next to a popular waterhole in the otherwise dry riverbed. Once set up to catch any movement along the path, we left and put it at the back of our minds. It is extremely important to leave the trap for as long as possible before returning to check on it – your scent from being in the area may put certain species off taking the path and result in a lack of accurate data collection. Two weeks later we returned to grab the SD card and examine the photos and videos the camera had captured. Take a look at the video mashed together from different video recordings of Leopard’s on the game path! We were amazed to have such incredible insight into the lives of one of our most elusive predators. We seemed to have struck lucky and placed the camera opposite a scent-marking bush – it’s like the leopards’ version of Twitter, except they spray urine instead of posting emojis! It’s a fantastic example of the advantages of Trails Cameras. Non-invasive, working independently and perfect for remote wilderness areas, the trap provides data on the species present and can assist in determining population densities and individual identities. 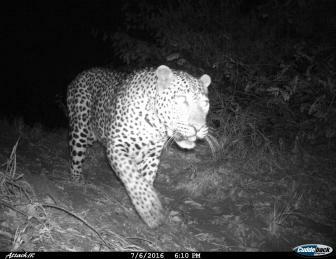 We’ve started collaborating with Zululand Rhino Reserve’s management team to see if we can identify the individual Leopards seen in the video. It is by no means a quick and easy task as the cameras can produce a huge quantity of images that need to be sifted through – but it certainly is a rewarding one! It is easy to see the advantages of using Trails Cameras to enter the world of our wildlife in a non-invasive manner.